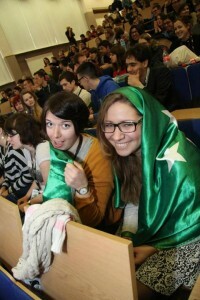 During a long and engaging closing plenary, AEGEE-Kyiv was anounced as the host local for the Autumn Agora 2015. Minutes before the announcement we spoke with Anna Pykhtina, current president of AEGEE-Kyiv, to know better their feelings towards this big event. The AEGEEan: First of all, what were you doing when the CD delivered the news? and how did you feel? You said that you told only to Mariia and one more person, Do your local knows now? Actually, I won’t tell them until the final results in Agora. I did tell people who won’t be present on Agora, like Alla Resheten, for example, and some others from the team, but I want it to be a real surprise during the Agora. This is going to be a massive surprise, then. What was not a surprise was seeing Kyiv as a candidate since your city is always on the top list of possible applicants. What pushed you to apply this time (for real)? Well, the idea to organize such important and big event appears in mind of every board member, I guess and you already told, Kyiv is always the one who is expected to apply – great location, big number of experienced and dedicated members, city itself.. and this idea was always in my mind since I became board member in October 2013. It was right before Agora Zaragoza but we realized that we do not have so motivated members. And I would never let us apply if we were only 99% sure we are ready. It’s said that everything happens for a reason. And I agree with this statement. Because one month after Ukrainians went to the main Kyiv Square (Maidan) to protest against the decision of ex-president V.Yanukovich to postpone the signing the EU-agreement with Ukraine. To be honest, we couldn’t handle with local events and weren’t able to predict what will happen next day. Half a year later, trying to attract more participants to come to Summer University in Ukraine, answering maybe 1000 questions about the situation, seeing that such important events like Network Meeting are attended only by 5-10 members (mostly of the closest locals) and talking to our Network Commissioner I realized that it is essential not only for our region, but the whole Network, as nowadays situation and it’s consequences are concerns of the whole Europe. And I believe that it will be great event to both organizers and participants. For the first ones, I’d like to invite as much helpers from other locals as possible. It is one of my targets for this year: to unite and all together represent the voice of the youth of Ukraine, to have needed support from government and have better promotion, of course. For participants and guests it will be also unique experience – to gather in historical place, where the real fight for the democratic future happened and taking into account what’s happening now between Russia and Ukraine, it is so important not to ignore it, but to shed the light on the situation, discuss it and share the opinions, give recommendations and hear thoughts of others. Thus, it will be useful to share experiences and knowledge. Therefore we, AEGEE-Kyiv, cannot find better possibility that invite the whole Network and host the biggest statutory event – Autumn Agora 2015. “I would never let us apply if we were only 99% sure we are ready”. Now you are president of your local, what makes you 100% ready? When I was doing bonus presentation to add to our application, I finished it with words “If not we, who? If not now, when?”. It’s the right time, we can’t wait no more. t’s hard to believe now that everything what has happened started by usual Ukrainian students and activists, who believed in better future of Ukraine taking the direction of European values.We as AEGEE fully supported the movement as it’s exactly what our organisation is working on in Europe for the last 29 years. There are right people. And huge advantage is to have still motivated AEGEE-members, who organized Autumn Kyiv Agora in 2009 – with their help we will organize the best one. And the location also great – apart from the fact it’s my favourite city, it’s been a while since Agora was in this part of Europe! You are speaking about the support of young and old members, but do you have also municipality or university one? Let’s say that we have people both in municipality and university who know about AEGEE and already worked with us in 2009. The university we are negotiating with now is the one where we stayed previous time and also lived during “The Big Kyiv Theory” TSU and the one that I studied in. It’s one of the oldest and the best ones not only in Kyiv, but in Ukraine and it’s dean is very Europe-oriented, so there won’t be problems.Talking about municipality, we never asked for their support as the level of buerocracy and corruption was too high during last years and we managed to do everything by ourselves. But now, after the Presidents and Parliament Elections, we already can see that it’s easier for us to ask for help and new leaders in the government realized the power of youth and the need of supporting us in all possible ways. As I already mentioned AEGEE-Kyiv will cooperate with other Ukrainian locals, as they also need the support, so together, step by step, the expected outcome will be achieved. Speaking about other UA locals, how did they welcomed the idea of hosting an Agora in your country? 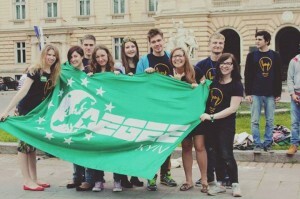 Only AEGEE-Kharkiv and AEGEE-Lviv know that we applied. 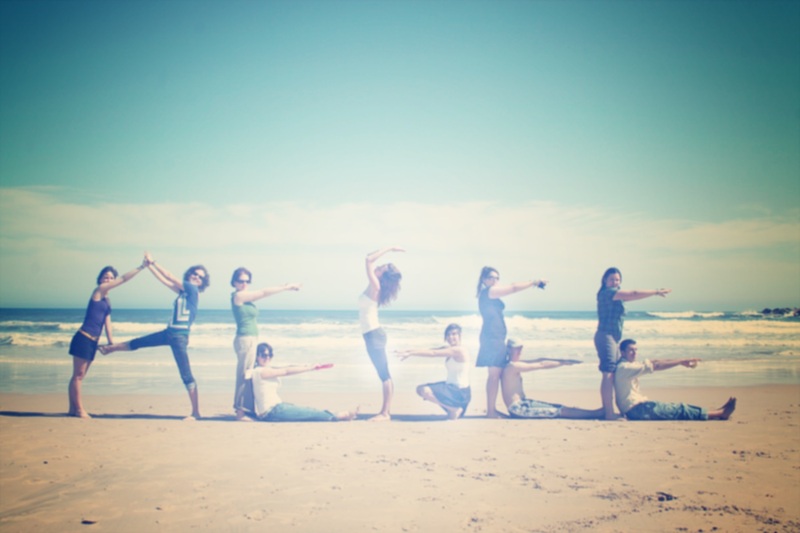 It is my personal attitude probably, but I do not like to tell about thing that are only planned to be done. That’s why we didn’t announced it to the Network as well. When submitting the applicated we were asked to add letters of support. So I asked AEGEE-Lviv’s president Alexandra Okhrimenko and she totally supported the idea, saying “Finally!” and wrote one for us. And during the NWM Kharkiv we confessed that we applied as we were brainstorming about the ways of how to make Ukrainian locals more active not only on European, but local level and unite. I really would love Agora be the reason for raising the motivation for Ukrainians and I am increadibly happy that we, AEGEE-Kyiv, can offer the opportunity to other locals and therefore, help them to show their members the importance of being active member, active citizen, active person by volunteering. I want to step back for a second and speak about the political situation in UA. It was difficult this year to find participants for SUs and NWMs. Do you think this could prevent people to apply for Autumn Agora Kyiv? Yes, the whole world was talking about Ukraine but the whole world also heard a lot of rumors and got wrong impressions about the situation in Kyiv and other cities.It’s hard to believe how is it possible to live in the country where 20 minutes from my house the protest took place and everything is absolutely peaceful in my district. And we would never omit the fact that 500 km away from Kyiv there was a real war and we do not put pink glasses, saying everything is calm in the whole country. Ukrainians were scared so we wouldn’t expect that citizens of other countries won’t, especially seeing what media was showing in their countries. It’s called the 4th power and it is really powerful mean of using people’s opinion. Even in my family there are two fighting members, victims of newspaper’s articles, so what can we expect from people who do not live in Ukraine? Nevertheless, we got huge support from Comite Director and AEGEE-members who helped in sheding the light on the situation: numerous articles and posts, positions papers, speaches at Statutory events and coming of Luis Alvarado Martinez and Election Observation Mission (already twice). And had amazing Summer University, absolutely safe and unforgettable one with withing Maidan and although we had to ask SUCT for open-calls, our participants were satisfied and didn’t want to leave. I cannot predict what will happen in one year, but seeing that situation is better now and that many other important events are taking place in Kyiv ( just like Kyiv Agora Security 2014 and many other conferences with contribution of OSCE and EU-Institutions) as it was planned makes me feel sure that now it its time to act. And if we are chosen it means that we are believed in, so even if we receieve 600 applications, it will be Agora with 600 applications. And being asked by many AEGEE-members how to help Ukraine I can suggest only one thing – do not be afraid to come, to see, to discuss, to hear and to be heard.